Antioxidants are a hot topic. We’ve previously discussed one type of antioxidant, flavonoids, in several ERD articles, including ‘Blueberries every day keeps high blood pressure at bay’ in issue 6 of ERD and ‘Don’t forget the cocoa!’ in issue 2. Flavonoids are typically divided into five different subgroups: anthocyanins (the "blue" in blueberries), anthoxanthins, flavanones, flavanonols, and flavans (which are of interest to chocolate lovers everywhere, and also this study). The flavans subgroup includes flavanols, which are the biggest source of flavonoids in cocoa— primarily catechin, epicatechin, and procyanidins. The main flavanols in cocoa are catechin, epicatechin, and procyanidins. These molecules have antioxidant properties. Antioxidants have been studied for a number of different beneficial outcomes, including improvements in the skin’s appearance and protecting the skin from sun damage. Results of previous trials that evaluated flavanols in cocoa, however, have been mixed. Some studies have shown positive benefits of cocoa consumption on protection from sun damage and skin condition, while others have not. This study aimed to overcome some of the limitations of previous studies by extending the length of the trial and being more selective in the study population. Prior studies only lasted six to twelve weeks, and included both men and women, as well as younger participants. The hope was that by reducing possible variability in the measurements, and allowing more time for changes to be observed, a clearer picture would emerge regarding the effects of cocoa on skin condition. Previous studies investigating the effects of cocoa flavanols on the skin have shown mixed results. This study was designed with a longer trial duration and a less diverse study population to overcome some of the limitations of previous studies. Researchers recruited 62 healthy Korean women for this study. They were all between 43-86 years old (the average age was early 60s), and had visible facial wrinkles. None of the women had any cosmetic anti-aging procedure in the three months prior to the study, nor did any have diets that included “functional foods” particularly high in antioxidants in the month prior to the study. Half were randomly assigned to consume a powdered beverage containing 320 milligrams of cocoa flavanols from minimally processed cacao beans daily, and half were assigned to consume a nutritionally matched and artificially chocolate-flavored beverage powder with no cocoa flavanols. The participants had noninvasive assessments of their facial skin done at the beginning of the study, at 12 weeks, and at 24 weeks into the study. A silicon mold was made based on a small section of facial skin, then the topography of the mold was measured for roughness, which was expressed in various R values. As wrinkles in the face increase, the R values go up, and vice versa. The elasticity of the skin was determined by applying suction to an area of skin and measuring the skin’s resistance to the suction and its ability to return to its previous shape. Finally, skin hydration was measured using a small probe called a tewameter, which calculates the rate of water evaporation from the skin’s surface. The study was double-blinded, so the researchers taking the measurements did not know which beverage each woman had been assigned to consume (and neither did the participants). In addition to these noninvasive measurements, 10 participants from the cocoa group and nine from the placebo group agreed to undergo exposure to ultraviolet light. At baseline and at the end of 24 weeks, one-centimeter square areas of skin on the participant’s buttock were exposed to increasing doses of UV-B, the short wave ultraviolet light primarily responsible for sunburns. The researchers assessed the irradiated areas of skin 24 hours after exposure to determine the minimum UV-B dose needed to produce a sunburn, known as the Minimal Erythema Dose (or MED, shown in Figure 2). All participants had blood samples drawn at the beginning and end of the study to assess the safety of the cocoa supplement, and had their weight tracked at each visit. Researchers also assessed compliance at 12 and 24 weeks by checking the number of beverage packages remaining. Middle-aged and elderly Korean women were given a daily beverage containing cocoa flavanols, or a placebo beverage, for 24 weeks. Measures of skin wrinkles, elasticity, and hydration were quantitatively measured, and tolerance to doses of ultraviolet irradiation were tested at the beginning and end of the study. The study’s findings are summarized in Figure 3. After 12 weeks of consuming the cocoa supplement, there were no differences in any of the facial roughness or facial hydration measurements compared to the placebo group. One of the three elasticity measurements (gross elasticity) showed a statistically significant improvement in the cocoa supplement group, while the other two measurements (net elasticity and biological elasticity) were statistically unchanged. On the other hand, after 24 weeks, all three markers of skin elasticity showed statistically significant improvements, averaging about a 10% improvement in the measurements compared to the placebo group. 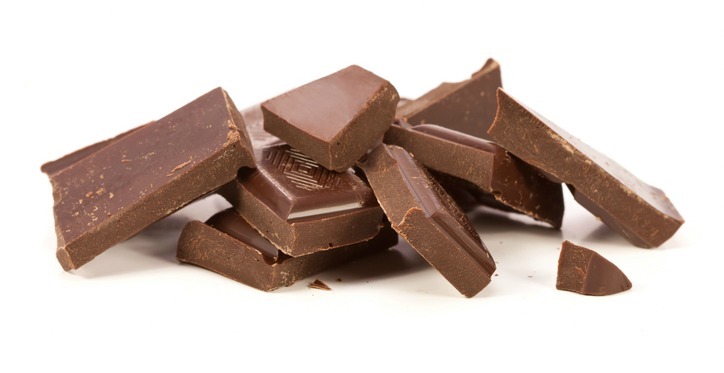 Two markers of skin wrinkles, average roughness (Rz) and maximum roughness (Rm) also showed statistically significant improvements in the cocoa supplement group, showing an improvement of approximately 8-9% over placebo measurements. For the smaller group that also received the UV-B exposure, cocoa supplementation also produced a statistically significant effect. While the MED of the placebo group was basically unchanged after 24 weeks, the cocoa group could tolerate a dose of UV-B irradiation that was, on average, 65 millijoules per square centimeter (mJ/cm2) higher before producing a sunburn. There were no safety concerns, and the compliance rate of the study was extremely high, at around 97-99%. Which is not a surprise, as people tend to enjoy chocolate, with some (non-rigorous) studies showing greater craving in females than in males. What WAS surprising was that a statistically significant difference was seen in the weight of the cocoa group, compared to the placebo group. While the study was not controlled for other environmental factors like diet and exercise, and thus no conclusive findings can be drawn from this particular dataset, the researchers observed that the placebo group gained an average of 1.5 kilograms over the course of the study while the cocoa group, on average, was relatively unchanged, gaining only 0.04 kilograms. While almost no differences were seen between the treatment and placebo groups after 12 weeks, several measurements of skin roughness and skin elasticity were positively affected by cocoa supplementation after 24 weeks. The women who consumed the cocoa beverage were also able to tolerate a higher dose of UV-B irradiation before their skin became sunburned. Overall, the study shows some small, statistically significant changes in skin elasticity, wrinkles, and resistance to UV-B radiation are caused by consumption of cocoa flavanols. It also shows that a longer, 24 week period is needed to see statistically significant differences between the treatment and placebo groups, confirming the researchers’ hypothesis that previous studies of shorter duration were not sufficient. An important thing to note about the data is that all the treatment group measurements are reported as percentage changes compared to the placebo group - what you would really want to know as a possible consumer is how it affected your skin, not how your skin compared to someone else’s. When you dig into the group’s measurements compared to their own baseline, the numbers are slightly less impressive. Over the course of the 24 week study, the improvement in skin roughness (wrinkles) in the cocoa group was only about 1-6% from the group’s baseline measurements—a change that may not even have been visible to the casual observer. Skin elasticity fared a little bit better, showing improvements in the range of 3-9%. The researchers did note in their analysis “... the sizes of effects were smaller than other direct curative strategies such as topical tretinoin, laser resurfacing, and chemical peeling”. They also suggested that the cocoa flavanols might be more effective in preventing wrinkles when consumed for a longer duration and starting at a younger age, rather than as a treatment once wrinkles and loss of skin elasticity have already appeared in older women. The UV-B exposure data hold up slightly better. The median MED for the 19 participants at the start of the study was 160mJ/cm2. The placebo group’s MED was statistically unchanged compared to baseline after the 24 week study, while the 65 mJ/cm2 increase in the cocoa group’s MED was not only statistically significant, but also represented a 40% increased tolerance compared to baseline - basically a modest sun protection factor (SPF) of 1.4. The researchers noted that the study took place in the winter, which may have had an effect on some of the measurements, particularly skin hydration. However, the length of the study does provide a benefit over previous studies that had much shorter durations (six to 12 weeks). One other benefit of the study was that it was conducted in a homogenous population in terms of race, age, and gender. This eliminated some of the factors that may have confounded the results of previous studies. The downside, of course, is that the results can’t be readily applied outside of this specific study population, namely, middle-aged and elderly Korean women. The length of the study is its main strength. Its main weakness is that while the data for skin roughness and skin elasticity are statistically significant, cocoa supplementation may not have produced any visible changes in wrinkles or skin appearance because the differences from baseline measurements in the treatment group were small. This lends some support to the idea that cocoa flavanols may be more useful for preventing wrinkles rather than treating existing wrinkles. The specific study population likely eliminated some noise from the data collection, but also limited its applicability more broadly. The data from this study support many of the conclusions from previous trials, including the fact that nearly no statistically significant effects were seen at the 12 week mark, where many other earlier studies stopped. The fact that skin elasticity showed improvements before skin roughness and wrinkles did is also in line with previous observations. Regarding the observation that the treatment group maintained their weight while the placebo group gained weight over the course of the study: previous reports have suggested a number of possible mechanisms for cocoa flavanols playing a role in weight-related pathways, including effects on insulin receptors that alter the development of fat cells, and affecting the digestion of fats and carbohydrates, possibly increasing satiety. Researchers have investigated the role of cocoa flavanols for weight loss in rats, and in a dietary assessment of over 1000 healthy people, a positive correlation was observed between higher frequency of chocolate consumption and lower BMI. But there haven’t really been any clinical trials designed to directly assess the effects in humans. So for now, this is still just an interesting isolated observation. The cocoa flavanols used in this study may be only one of many possible beneficial antioxidants for improving skin’s appearance. A number of facial creams have antioxidants added to them to deliver these nutrients directly to the epidermis, and dietary nutrients such as beta carotene (and other carotenoids) and lycopene have previously been shown to have photoprotective effects. Even resveratrol, one of the antioxidant molecules found in red wine, is being investigated for topical application. A 2013 review reported 14 different dietary or topical antioxidants that have evidence for protective effects on the skin, and suggested that combinations of multiple antioxidants may have synergistic effects (that is, a larger effect than the individual effects added together). In short, antioxidants are probably good for the skin regardless of what dietary source they come from, and the more the merrier. But some people happen to think chocolate tastes better than carrots. Data from this study support previous conclusions from earlier trials. While cocoa flavanols may provide some benefit to the skin, they are likely only one of many antioxidants that may improve the skin’s appearance and protect from sun damage. How much chocolate would I have to eat to experience the same benefit as the participants in this study? You’d need about 320 milligrams of cocoa flavanols, or somewhere between eight and 25 grams of dark chocolate (70%+). That works out to roughly 50-150 calories (a couple of “fun sized” bars or a quarter to a half of a regular sized chocolate bar). The higher the cocoa percentage, the less you’d have to eat. Other studies have used higher doses of cocoa flavanols, which could equate to nearly twice as much chocolate consumption. Would cocoa flavanols be effective for men? Since this study was only conducted in women, it’s harder to draw support from the data for a similar supplementation strategy in men. Aging skin is the result of a number of different environmental and biological factors. Some of those biological factors have gender differences like hormonal patterns and gene expression. As previously mentioned, there are a number of other flavanols that might be beneficial to the skin’s appearance. So it’s possible that there could be a similar effect in men, or there may be a completely different mechanism in males that could be unaffected by the cocoa flavanols specifically. More research is needed in different study populations to tease out broader applicability. Korean women over the age of 40 saw a modest but statistically significant improvement in facial skin surface roughness and skin elasticity after consuming a flavanol-rich cocoa beverage for 24 weeks. The women who consumed the cocoa flavanols also had a mild “internal sunscreen” effect and were able to tolerate a higher dose of UV-B irradiation before producing a sunburn than those who consumed a daily beverage without cocoa flavanols.